Although we are now well into summer, we are still celebrating the accomplishments of NYSID’s Class of 2014. The BFA, MFA and MPS students worked incredibly hard to produce thoughtful thesis/capstone projects, and more than 100 of these projects are on view at the NYSID Gallery, 161 East 69th Street, and the Graduate Center, 401 Park Avenue South. See a selection of these projects here. During the month of the July, we will be spotlighting some of the thesis projects and giving you the chance to hear directly from the designers. First up is a Q&A with MFA-1 graduate Hyemi Kang. Hyemi is originally from Seoul, Korea and has a BFA in furniture design and ceramics. She won the Chairman’s Award for her thesis project—a new, inspirational, and flexible space for dormitory living called the Dormetelier. The space is more than 100,000 square feet with two floors and a mezzanine. It reflects the school’s objective of encouraging free expression and inspiring creativity. The ground floor houses the public areas: a lobby, auditorium, shared student activity spaces, cafeteria, and offices. 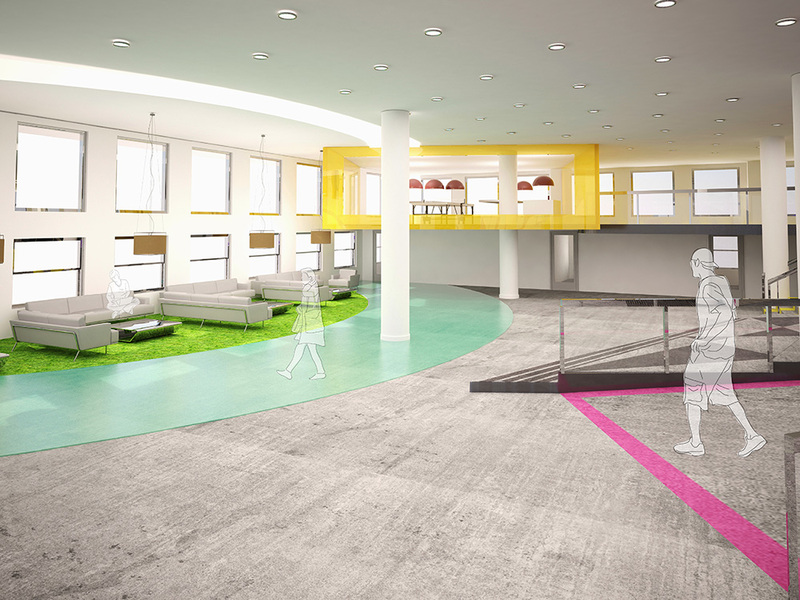 The mezzanine is meant to be a multi-purposed, flexible space, including a gaming area. The private, residential rooms are on the second floor with three different dorm room layouts, a shared kitchen and dining area, and gym. There is also an outdoor skateboarding courtyard which can be used as a temporary exhibition area. Why did you want to design student housing for your thesis project? Since most schools close around midnight, students don’t have space to stay when they want to continue their work after hours. Because of this, the proposed dormitory combines an atelier and living area together. Atelier is the French word for "workshop," and in English is used principally to mean the workshop of an artist in the fine or decorative arts. Compared to typical university dorms, which are generally just for living, this proposed dormitory for art students encourages collaboration between students with different majors. What else about Dormetelier differs from traditional student housing? Many schools require living in a dormitory during the first year, and the accommodations usually have the same repeating layout and do not allow students to work because of strict regulations in the facilities. This art school wants students to be freer and be inspired by their surroundings. The dormitory and student activity center (where students may spend the most of their time) fosters an inspirational and collaborative environment that exposes them to the global art world and helps build relationships. There is space in the Dormetelier for students to make art with materials that are usually banned from traditional student housing, such as spray paint, glue, and sculpting materials. In what ways are the dorm rooms different and how would you describe the design approach? Can you also talk about the prominent staircase in the common area & use of color? 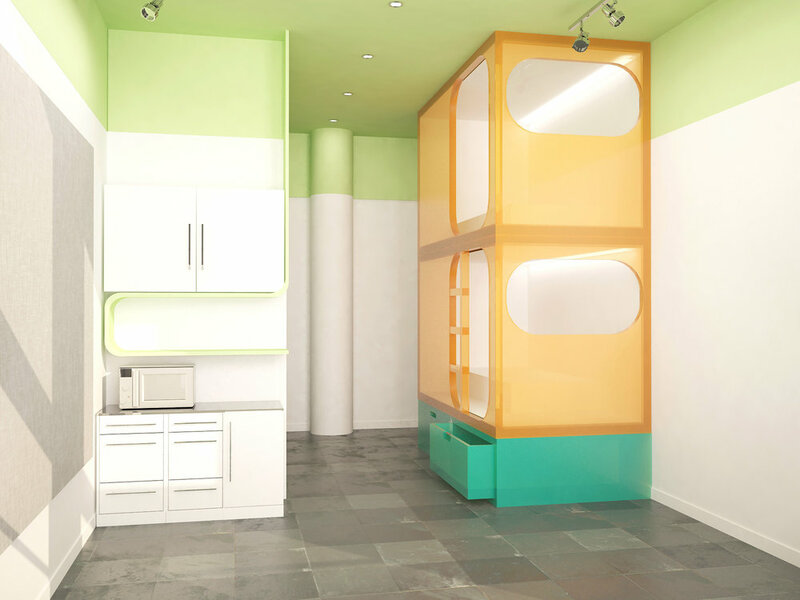 For the design of dorm rooms, I played with three modules: the area where the bed is, the bathroom, and the kitchenette. I stacked these elements in different ways to make the room as practical as possible. I also considered students’ preferences when varying the layouts. For example, if somebody doesn't want to climb a ladder every day to get in to bed, or perhaps they prefer to have a large atelier or lots of storage space —the space can be customized to fit their needs. 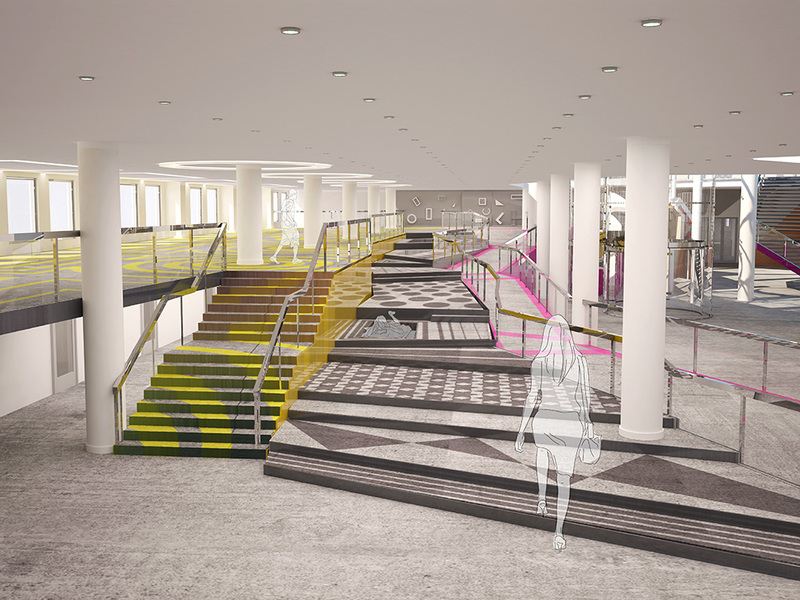 As for the staircase – it leads to the mezzanine floor, which can be used for public events, student activities, and exhibitions. The floor patterns are inspired by the structure—the yellow graphics follow the outlines of the rectangular and round columns, which are then spread out to make new patterns. Now that you’ve graduated, what do you have planned for the future? I’m currently interning at HOK. Long term, I hope to be a professional in hospitality and conceptual interior design.